Since 2012, NFWI-Wales has been working with Joyce Watson AM, Assembly Member for Mid and West Wales to engage men in pledging their support to never commit, condone or remain silent about violence against women. By getting more and more men involved in the Campaign, we aim to create a culture where violence against women is unacceptable. Take part in the Not in my Name Competition - 'A Calligraphy or Word Art Picture in any medium'. 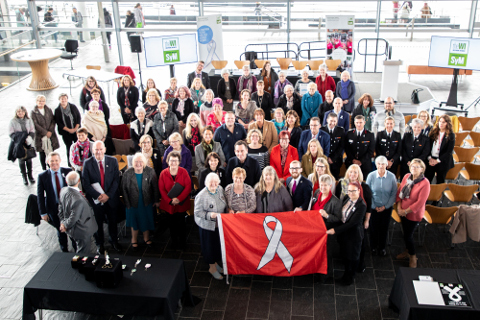 Join us at the Senedd on 25 November to mark White Ribbon Day. Further information to follow. Recruit male ambassadors from your community to pledge their support to never commit, condone or remain silent about violence against women. Make white ribbons to donate to the ambassadors recruited. Organise a photo opportunity of the male ambassadors holding / signing the poster. Establish links with local authorities (a number have or are working towards gaining White Ribbon accreditation) and other women’s groups in your area such as Women’s Aid and Hafan Cymru to organise joint awareness raising activities. Keep NFWI-Wales updated on any local action that you will be taking part. On 20 November 2018, we held a cross-party stakeholder event and a Candlelight Vigil at the Senedd. Find out more here. NFWI-Wales organised a lunchtime cross-party stakeholder debate and a candlelight vigil at the Senedd on 22 November 2016 to mark International White Ribbon Day. Sponsored by Joyce Watson AM, the candlelight vigil took place on the steps of the Senedd and involved a short walk around the Pierhead building followed by brief statements of support by ambassadors. In February 2016, NFWI-Wales established a prose competition for members on the title 'Not in my Name'. The winner and runners-up were announced at the NFWI-Wales Public Affairs Conference in Llanelwedd and entries were published during the 16 Days of Activism Against Gender-Based Violence. 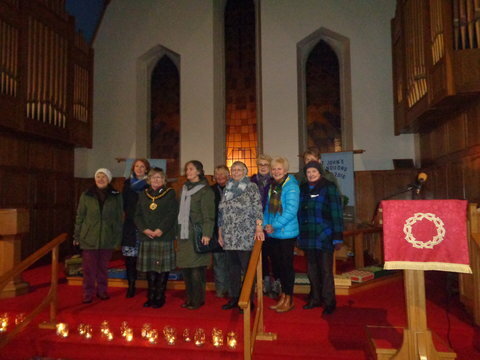 The Conwy Valley Group of WIs held a Candlelight Vigil outside St John's Church in Llandudno on 22 November 2016. Around 30 WI members participated supported by the Mayor of Llandudno, Councillor Carol Marubbi and the Mayor of Conwy, Councillor Pat Hart. Also participating were staff from Women's Aid and sisters from Noddfa (Penmaenmawr). In the weeks leading up to the vigil several male groups signed posters and sent photographs (wearing white ribbons), including the Beulah Brass Band, Cor Alaw, Llanfairfechan and Penmaenmawr and Llandudno Rotary Clubs, Llandudno RFC, Penmaenmawr Town Council, Plas y Brenin Mountain Group and the Parochial Church Council of Holy Trinity Church, Llandudno. Statements of support were also received from Guto Bebb MP and Mark Isherwood AM. The Programme of Government included a commitment to introduce a VAW Act focusing on prevention, protection and support. On 10 March 2015, the National Assembly for Wales passed the Violence Against Women, Domestic Abuse and Sexual Violence (Wales) Bill. The Bill received Royal Assent on 29 April 1015. Following significant strengthening, this ground breaking legislation has the potential to put Wales at the forefront of global efforts to eradicate domestic abuse, sexual violence and all forms of violence against women. We are a member of the Wales Violence Against Women Action Group. The coalition comprises a broad spectrum of organisations including campaigning organisations, charities, service providers, academics and trade unions. The purpose of the coalition is to share experiences and skills to tackle VAW in Wales through raising awareness, challenging attitudes and pressing for improvements in policy. The Wales VAW Action Group led a strong campaign for the Violence Against Women, Domestic Abuse and Sexual Violence(Wales) Bill to be strengthened. In 2013, the Action Group launched an authoritative report giving their priorities for the legislation on the ending violence against women and making recommendations to the Welsh Government. The report outlines key priorities, including a reduction in the prevalence of all forms of violence against women and support for women who experience violence; equal access to specialist support services; compulsory preventative initiatives in schools and other educational settings; improved responses to women from the health service, and workplace initiatives to assist female employees.The Action Group also released a calendar for 2013, with alarming statistics for each month of the year illuminating the prevalence of violence against women in Wales. In 2009 the group published a report,Violence Against Women: Why an Integrated Strategy in Wales? calling for a thorough review of the Welsh Government's policy to tackle VAW. In July 2011 the group launched Steps to Safety giving a snapshot of progress made by the Government since the introduction of the Right to be Safe Strategy, and in November 2013 published its follow-up report Steps to Safety 2. The intention to end violence and to tackle all forms of violence such as sexual violence, harassment and trafficking has been outlined by the Welsh Government, though unfortunately it has still not been implemented throughout the strategy. The All Wales Domestic Abuse and Sexual Violence Helpline is a confidential, freephone support and information service. Live Fear Free is a Welsh Government Website, providing information and advice for those suffering with domestic abuse, sexual violence and other forms of violence against women.